SPRINGFIELD – The Very Rev. 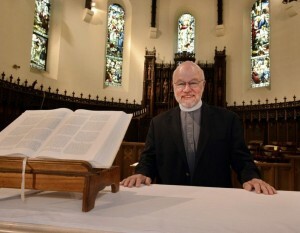 James G. Munroe will celebrate his final liturgies Sunday at 10 a.m. and 12:15 p.m. as head of Christ Church Cathedral. Munroe is retiring as the sixth dean of the mother church for the Episcopal Diocese of Western Massachusetts, but not from ministry. He will travel from his home in Classical High Condominums to Manhattan on weekends, beginning this fall, to assist at the Parish of Calvary-St. George’s, which includes two churches at separate locations, in the Episcopal Diocese of New York. Munroe, 67, says he is ready for the transition. He was 51 when he was elected dean, after 14 years as rector at St. John’s Episcopal Church in Northampton. Earlier assignments for the Boston born Munroe were in Greenfield and Auburn. “I have shrunk; my eye glass prescription is stronger; I am on blood pressure medication and my hair is completely white,” joked Munroe, who still runs and mountain climbs, when asked how he has changed in the last 17 years. He then added how his congregation has changed. Munroe said he much enjoys his life in ministry, though his initial path to ordination was not direct. The path, however, informed his life as a storyteller who likes to draw on popular culture in his sermons, and a volunteer with the Amherst-based Veterans Education Project. His self-depreciating humor is that of a cleric with a bit of his own Pope Francis like effect — he likes to minister beyond the cathedral’s Longmeadow brownstone exterior on Chestnut Street. The Right Rev. Douglas J. Fisher, Western Massachusetts diocesan bishop, paid tribute to Munroe’s outreach ministry when asked about his legacy. A graduate of Williams College, Munroe considered using his degree in English for a career in journalism. He had interrupted his education at the Williamstown college after his freshman year to serve with the Marine Corps. His two-year enlistment was cut short, after two months in Vietnam, when an explosive, thrown by North Vietnamese soldiers outside of Da Nang, landed in his foxhole on Feb. 23, 1969. It injured him and killed the soldier next to him. “I healed physically, but the post traumatic stress has taken longer,” said Munroe, who returned to college and decided in his senior year to pursue the priesthood. He studied at seminaries in Oxford, England, and in Virginia, and was ordained in 1975. I think of Jim driving a van through the city on Tuesday nights looking for the homeless. “Those who are in decision making roles for our country need to do so with an awareness of the cost of war. Sometimes it is done too quickly without realizing the cost,” Munroe said. Munroe believes “the need to be loved and wanting to be love” drives all human need, and said his spiritual duties are framed by his belief in grace and the unconditional love of the divine. “The spiritual growth of a parish is embraced by grace. This is to be a church that understands that law has its limitation and that God’s grace is the power plant that finally gets things done. This is the radical grace of God’s unconditional love and it is important to trust in that more and more,” Munroe said. “One of his mantras has been that young people are not knocking saying please can we come in. He has urged us to go out where they are. He said try 50 things, even if 49 things don’t work,” Munroe said. The Rev. Canon Tom Callard will take over as priest in charge of the cathedral. “It will be important to be gone from the cathedral to turn the reins 100 percent over to Tom and the cathedral leadership for all the baptisms and weddings and funerals to come. I will not be part of the life of the cathedral so it can move into the next chapter,” said Munroe, who was honored last weekend at a reception attended by 200.